OXFORD, Miss. 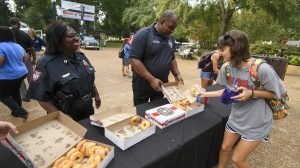 – Thelma Curry, a captain in the University of Mississippi Police Department, has been a familiar face on campus for more than 40 years, but she recently put down her badge for good. 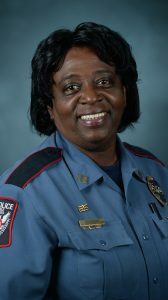 Curry, UPD’s captain of support operations, retired May 31 after a career that began on campus when she was an Ole Miss undergraduate. She was an intern with UPD and was encouraged to apply for an open patrol officer position. She was hired and never looked back. Through the years, she’s worked for seven different UPD chiefs and has seen the university grow from just a few thousand students to more than 20,000 on the Oxford campus. IOM: Tell us how you got started at Ole Miss. Curry: I came to school here as a freshman in 1975, and in 1977 I started working for the police department as a student worker. Along the way in my junior year, I was getting ready to do my internship and a position came open within UPD, so I decided, with some encouragement from some other folks, who said, “Why don’t you apply?” I did. Luckily, I got the position. It’s so funny because when I was asked then how long I expected to be here, I said, “Two years at most, until I finish my degree (laughs).” Along the way, I finished the police academy and then before you knew it, it was five years. The years just passed so fast. The beauty about UPD is every day at work is different. You never know what you’re going to do. IOM: Talk a little about how you went from easing into that job when you were young to figuring out this is where you wanted to be, and what you wanted to keep doing. How did it hit you? Curry: I just felt that I was helping the students. I was continually taking classes, so I was in school and in classes with a lot of students and just seeing them around, and if they needed something, even though I was a patrol officer, they felt comfortable coming to me and talking to me. IOM: What is it you like best about working on campus? Curry: I guess it’s truly the family atmosphere that you see here. Every August and September, you get a new group of people to speak to and be involved with, and, of course, seeing the campus grow as it has. There were 4,000 or 5,000 students when I started, up to more than 20,000 now. You can tell how the campus has changed and grown for the betterment of the students. Throughout all of the years, UPD has been focused on the students and their safety and making sure we get them out of here in a safe environment. IOM: Talk a little about that. I know you have seen a change in the campus since you started 40 years ago. Talk about what it was like when you started, compared to what it is like now. Curry: Oxford itself wasn’t as full blossomed, you may say, as it is now. There were very few activities for students to participate in off-campus. The majority of their activities were on-campus and we didn’t have as many residence halls as we do now. It was just that wholesome feeling, and the students pretty much got along. There always have been some type of issue going on, but through it all, the students always come together with the administration and they always work through the problems. IOM: Are there moments in your career that stand out to you? A few memories that you’d like to share that will always stand out to you, things you’re proud of? Curry: In recent years, I think one of the biggest things is seeing students in various activities like the Big Event, when it first started and getting students involved in different activities, going out and helping the community. If they get out and give back to the community, through events like RebelTHON, they’re doing stuff for other people. I think that makes a person well-rounded, when you’re looking after the needs of others. That makes them feel like part of the community and it sets some standards for them in life, like placing an importance of taking care of others and looking after the needs of others. IOM: Today is your last day. What are thinking about? What’s going through your mind? Curry: I had a moment this morning. I was like, “Oh, Lord. This is my last day leaving the house to go to work at UPD.” It’s bittersweet. At some point, everyone has to call it quits, in a sense, but it’s been a great career. I look back – we only had 13 patrol officers, and now we’re up to, like, 22. I’ve served through seven UPD chiefs. Just going through all of the different changes and each one of them had a different focus, missions, but still we all worked toward the greater good and toward the university’s mission to provide security for our students, the staff and visitors alike. For the most part, UPD has always been well-received by students. We try to be interactive with them. They don’t see us as the bad guy, so to speak. People know we’re here to provide law enforcement services, but there are those other things that we do. When I first started, we provided ambulance service to the campus, as well as police duties. We had EMTs. That was a service we provided, and just watching that change go over, it is just different aspects of the whole campus. We have substations for students. We have tried to be in the community with students so we’re more accessible to them. IOM: What’s next for Thelma Curry? What do you plan to do? Curry: First I’m going to rest a little bit (laughs). I’ll also work part-time at Kroger, so I will do that for a little while longer. I want to still be involved in the community, but some things I’ll stop doing. For a while, I didn’t know how to say no, then I had to learn how to say no. I want to get back involved with some things. I have served on various committees. When I became crime prevention coordinator in 1977, I became a board member of Family Crisis Services of Northwest Mississippi, and throughout the years I stayed involved with that because, at first, it’s kind of like a grassroots organization in that it has very little funding, so the volunteers and the staff do a lot of the work. I saw how it benefited those victims of family violence. Of course, I will stay involved with United Way. You can see the good that United Way does for all the different organizations and people that they help. I resigned from the board last fall, but I will continue to help out. Also, I have been volunteering with the food pantry. That is another need that is being fulfilled. I also plan to be more involved in church activities. IOM: Is there anything else you’d like to say to the Ole Miss community? Curry: The faculty and staff have been great. As far as the students, I have had so many people that I have met along the way, people I can call on for various reasons and there is always an answer or a willingness to help out in any way possible. I think when they say that this is one of the best workplaces, I can truly say that it is, but you have to put your heart into it and be involved with everything that is going on and do your part. This is the only way a real family works; it is everyone being a part and looking for the greater good. The greater good is the education of the students and having a welcoming atmosphere so that anyone who steps on this campus can feel like they belong. If we get all of that accomplished, this will continue to be a great university and a place that people will want to come and enjoy.